Wayne Poulsen is one of the founders of Squaw Valley Resort. In 1948 before the resort was officially opened, he and his wife Sandy were skiing one of the peaks that would become part of the ski area. Sandy was particularly intimidated by the steepness of the slope. In her own words: “I was scared to death. It was almost vertical. I thought I’d have to stay until spring!” So she traversed the slope did a kick turn, traversed back across the slope, another kick turn – you get the picture. Sandy’s husband was patiently waiting at the bottom of the slope and counted her kick turns. There were 22 of them! 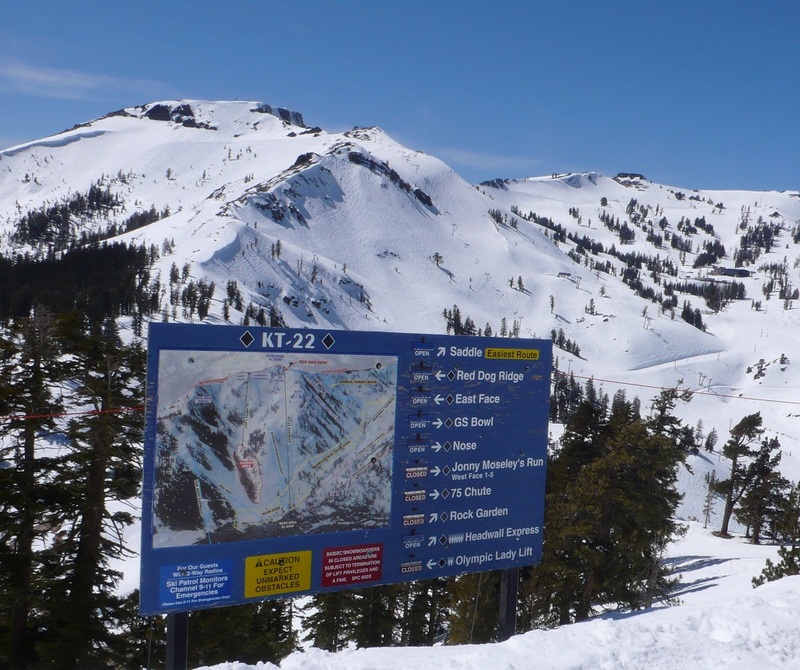 One of Squaw Valley’s most iconic areas got its name: KT-22! Lyndall Heyer and Ed Pearson both knew KT-22 was related to the number of kick turns. Speaking of kick turns, do they even teach kick turns anymore? They can be very handy. Last winter I was on a narrow traverse at Snowbird with my wife Meg following me and “cliffed out.” I made a kick turn, backtracked on the traverse, and then dropped below the cliff to get to the chute I wanted. I waited for Meg, and waited, and waited. She had apparently had difficulty executing the kick turn. But she used her time wisely, coming up with new terms of endearment for me! Let’s get back to trail names. We all know that the best trail names are the ones that aren’t on any trail map, but I’m going to stick to those that are on trail maps. It’s much more difficult for a person or persons to sit down and come up with a name that stands the test of time. I’ll use the Nose Dive as an example. Charlie Lord and Abner Coleman laid out the trail and oversaw its construction. The naming of the trail occurred in a meeting they had with state forester Perry Merrill. Since the trail was right under the feature on Mt. Mansfield referred to as the Nose, they felt the name should involve the word “Nose” and quickly agreed on Nose Dive. The name has stood the test of time. 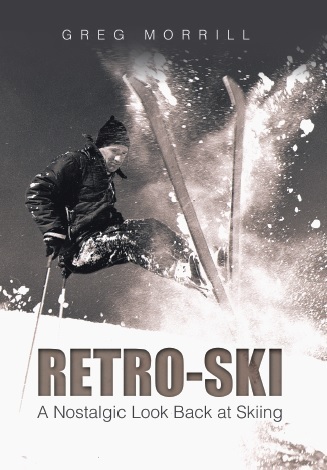 Even people who have never skied Stowe recognize the name and what it connotes. It’s interesting that probably many of those that recognize the name have no idea that the “Nose” is one of Mt. Mansfield’s features. They just know it must be a challenging ski trail. So what are some of your favorite trail names? Notice I said trail names and not favorite trails. Here are some my favorite Vermont trail names. At Jay Peak there’s Valhalla. On a powder day you know why that’s such a good name! Jay also has its Everglade which is a pretty creative name, but when they put in the Flyer Express lift which cut a swath through the Everglade, they named it Alligator Alley! That’s an even more creative trail name. Smugglers Notch has the Black Hole. I skied the Black Hole before it was the Black Hole. Gee, that almost sounds like advanced Physics! One day I spent a long time in there searching for a friend’s ski and we were beginning to think it had disappeared into a black hole. Another of my favorite trail names is Mt. Snow’s Jaws of Death. I guess I should have put that in the past tense since now it appears Mt. Snow has shortened the name to just Jaws. Somehow that’s just not the same. My first experience with the Jaws of Death was when I was in college and trying to become an expert skier. There was one icy spot on that trail that got me every run! So in my mind the trail’s name was very appropriate. Obviously names like Jaws of Death are usually reserved for expert trails and beginner trails get much softer names. But I’ve often thought that it would be fun to reverse that logic. Name an expert trail “Bunny Rabbit” and a beginner slope “Death Wish,” for example. That could curb some of the trail-name-dropping that you hear riding up the lift or at apres ski. Not too many folks are likely to brag about their great mogul run on “Teddy Bear!” Conversely, beginners could claim they made it down “Devil’s Staircase” without falling.